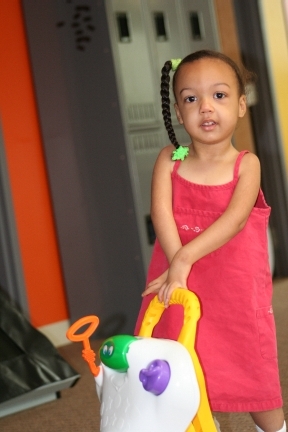 On May 25, 2007, at the age of 3 years and 7 months, Kya took her first unassisted steps, using a push toy to maintain her balance. She has undergone 14 corrective surgeries; wears splints regularly and attends physical and occupational therapy for two hours every week. Kya is bright, persistent and enjoys reading, learning and exploring new things. Her journey is challenging and she will have additional surgeries and therapy sessions to continue to improve her range of motion and ability to perform routine tasks independently. Thanks to the combined efforts of doctors, therapists, loved ones and Kya’s own fierce determination, she continues to make progress toward achieving her therapeutic goals. It is in that spirit, that we invite you to join our Krusade and help other children, like Kya, continue to take steps toward fulfilling their potentials.